The Good Fibrations exhibit will be on display through Aug. 26 at Studios on the Park in Paso Robles, with a Fabulous Fused Fabric Collage class on Aug. 14 from 1 to 3 p.m., and a Fabulous Fun with Fabric Paints class on Aug. 21 from 1 to 3 p.m. Each class is $15 per person. Visit studiosonthepark.org for more information. As a Girl Scout, her mother taught Aird and her troop how to make the style of nightgown (complete with a cap) that Washington helped popularize. "My mom always sewed. I would spend a lot of time in her bedroom, playing with fabric and sewing," Aird said. "Anything to do with fiber is fun." 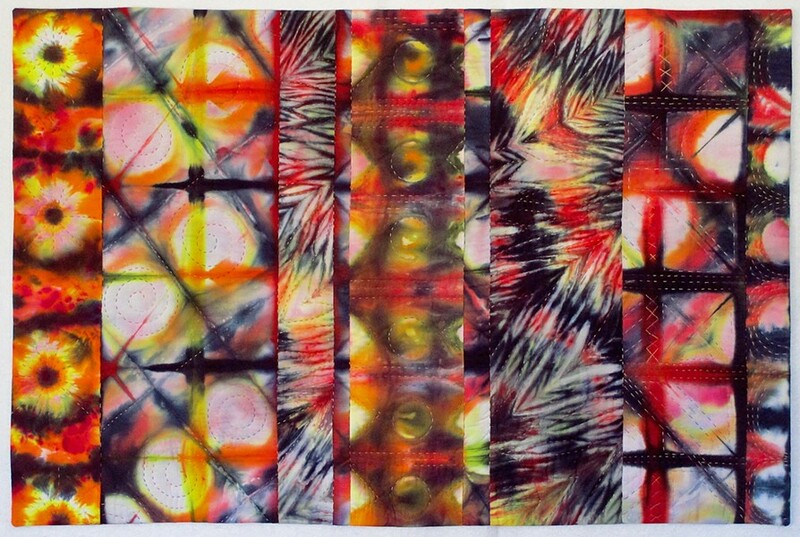 GALACTCIC Paso Robles artist Jeanne Aird takes her inspiration from sources like nature, colors, and patterns when creating quilt art pieces like Wondering About Mars. Later, Aird would be swept up in weaving, quilting, macramé, and shibori. In 1996, Aird began to create quilt art pieces, many of which are currently on display as part of the Good Fibrations exhibit at Studios on the Park in Paso Robles. WHEN IN SOLVANG Cartography is a recurring theme in artist Ellen November's work. So far, the Los Angeles transplant has quilted images of maps of local spots like Solvang (pictured), Laguna Lake, Mission San Luis Obispo de Tolosa, Cambria, Morro Bay, Pismo Beach, Nipomo, and Avila Beach. The former Flamson Middle School art teacher takes inspiration from nature, color, patterns, and environmental concerns. Her piece Wondering About Mars features vibrant reds, yellows, and oranges contrasting with black and white, interspersed with planetary orbs and light beams. While Aird knows that her work is fine art, she said that not everyone considers fiber art to be more than a craft. "Anything that is considered craft is considered less than, and I think a lot of that stems from how women in the arts are viewed," Aird said. "For a long time it was just women in fiber. So it's that same old story. There is that distinction that if something is utilitarian it couldn't be fine art." Artist Ellen November also found inspiration for her work featured in Good Fibrations from a utilitarian source: maps. Since relocating to the Central Coast from LA three years ago, November has made pieces inspired by local spots like Solvang, Laguna Lake, Mission San Luis Obispo de Tolosa, Cambria, Morro Bay, Pismo Beach, Nipomo, and Avila Beach. 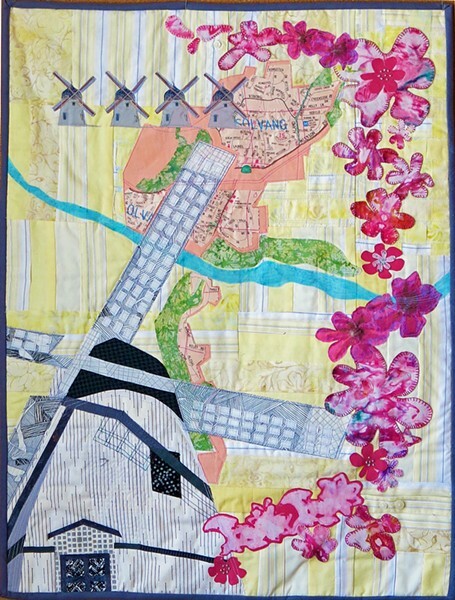 Her piece on Solvang features windmills as a nod to the town's Danish roots and culture that are still alive and well today. "It's places that are meaningful to me," November said. "It's almost like fitting a puzzle together. I consider what I'm doing fine art. I'm using quilting techniques, but really to me it's an illustration made out of fabric." Aird said she also hopes that the 50 or so pieces in the show will invite viewers to reconsider fiber's and fabric's place in the art world. Arts Writer Ryah Cooley is tying some macramé knots. Contact her at rcooley@newtimesslo.com.